If you are traveling to the UK for a short trip, you may be wondering if you can use your cell phone (called "mobile phones" or simply "mobiles" in London). You actually have three choices when it comes to mobile calling in the UK: 1) Activate an international plan with your cell phone provider; 2) Rent an international cell phone; or 3) Purchase an unlocked phone and SIM (Subscriber Identity Module) card that works in another country. The first option, purchasing an international plan, seems like the simplest, but it will probably be the most expensive. Most carriers charge a monthly fee (or one-time charge), plus a per-minute calling fee, texting fee, and data fee (which can be a lot of money for a little bit of data). The second choice, renting an international cell phone, is somewhat convenient—the phone is shipped to your home with an initial airtime balance—but you will have to mail the phone back when you return to the states; since there is a daily fee, you may end up paying for days you don't use the phone. 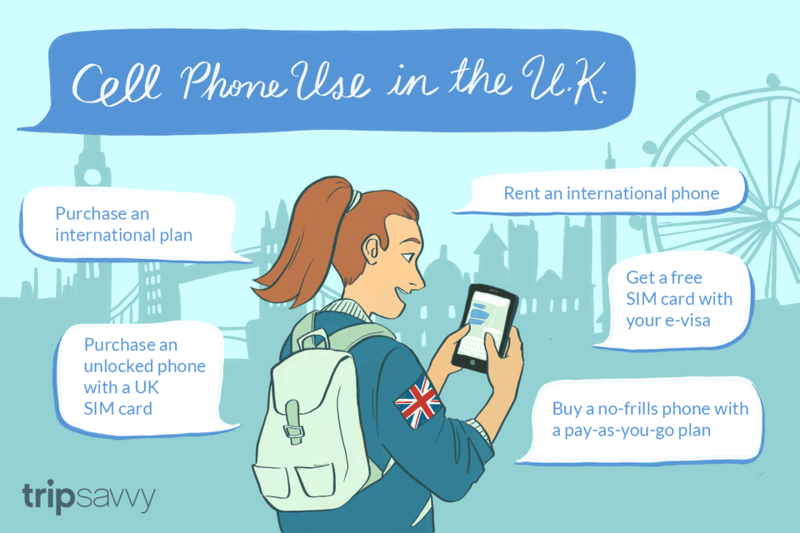 Luckily, pay-as-you-go mobile phones are very popular in London, and there are several places to pick up a pay-as-you-go cell phone with many plan options. If your phone is unlocked, you may be able to just buy a new SIM card (the telephone number and network information card that goes inside the handset) but it depends on the compatibility with your current network and the UK network you choose. Speak to your current phone company to see if they know which UK SIM cards will work in your handset. SIM card packages from Virgin, for example, cost somewhere between £5 and £10 ($6.50 and $10.30), and fit into an existing phone. The SIM cards can also be used again. Cellular Abroad offers a World SIM that has a cheaper rate for calls overseas so this could be a good option for staying in touch with home. The local rate is a bit higher so think about your needs before choosing a SIM deal. If your phone isn't unlocked or you can't find a compatible SIM card—or you simply don't want to use your phone—then a pay-as-you-go deal complete with handsets and SIM cards are the best way to go (and you'll often get some free credit towards calls too). The main mobile phone companies in the UK are Vodaphone, Orange, T Mobile, O2, Virgin Mobile, and Three. Call prices vary with each company so check what suits your requirements. Londoners are pretty big on sending text messages to save on call costs (which can be five times the price as texts). If you only need a phone to make international calls, London has many stores that sell prepaid handsets. These budget, no-frill phones come with a pay-as-you-go plan. A pay-as-you-go plan is a very sensible idea for a short trip since you don't need a contract—you simply buy credit for the phone from newsagents or phone shops—look for the "Top-Up" signs. To get more of an idea of what's available, check out Carphone Warehouse and Argos for pay-as-you-go deals.